NASA's most powerful eye in the sky above Mars has bounced back from a recent computer glitch and resumed full duties observing the Red Planet. 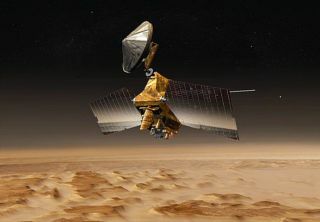 The Mars Reconnaissance Orbiter recovered from its March 9 glitch on March 13, mission managers said. "The spacecraft is healthy, in communication and fully powered," said Mars Reconnaissance Orbiter Project Manager Dan Johnston of NASA's Jet Propulsion Laboratory, Pasadena, Calif., in a statement. "We have stepped up the communication data rate, and we plan to have the spacecraft back to full operations within a few days." NASA launched the MRO mission to Mars in 2005, and the spacecraft entered orbit around Mars a year later. Since its 2006 arrival, MRO's mission has been extended three times, most recently in 2012.